Polyurethane strippers generate high holding pressure and strip the blank cleanly from the punch, resulting in an optimum working condition for the punch and longer effective work life. 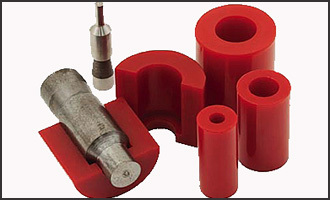 Urethane strippers are suitable for all commercially available punch shanks and punch retainers. The punch shape cut by the first hit, combined with the existing inside diameter of the stripper guarantee a self gripping effect. • Easy Installation and Replacement - No need for set screws or stripper bolts. • No Sharpenellizing (Flying into pieces, when fractured under load) thus preventing injury to worker and damage to the die.